Old timers still recall when Cherokee County was rural with a small-town feel, but all that started to change a couple of decades ago as the county made the transition to suburban. Then the pace shifted into high gear. Today, Cherokee is a vibrant business community and prime destination for new companies. 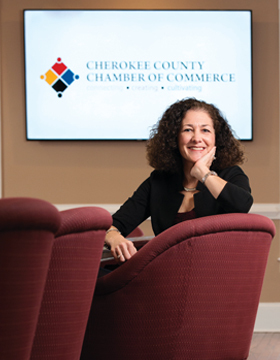 “We’re continuing to see positive growth, and businesses continue to expand here, relocate here and provide jobs in our community,” says Pam Carnes, president and CEO of the Cherokee County Chamber of Commerce. The towns still boast picturesque main streets, but these days you’re likely to find shops and restaurants filled with millennials drawn here by walkable downtowns and mixed-use development. Subdivisions and shopping centers have sprung up to serve this fast-growing population. The sprawling, once-rural county in North Metro Atlanta has grown from about 90,000 people in 1990 to nearly 236,000 today. According to statistics from the Atlanta Regional Commission, the population is expected to increase 68 percent – or 159,200 people – between 2015 and 2040. Cherokee has long been a bedroom community and continues to send about 78 percent of its working adults to jobs out of the county. But leaders and economic developers aim to change all that and create a bigger local job market. The southern end of the county has experienced the greatest population growth and a flowering of retail and commercial development thanks in part to an opportunity zone designation, which offers tax incentives for job creation. The county’s most recent win is shoemaker adidas, which will build its first North American factory on a section of land just outside Woodstock in the Cherokee 75 Corporate Park – part of an opportunity zone. “It’s advanced manufacturing, which fits in well since we’ve got Chattahoochee Technical College two miles away and they do tailored training and specialized programs for companies,” he says. The German shoemaker plans to construct a robot-powered “Speedfactory” that will begin operations later this year. It will employ some 160 people and is expected to produce an estimated 50,000 (mostly running) shoes annually. The new plant is a reversal for the shoe industry. For decades, companies moved operations to South America and Asia to take advantage of cheap labor. The new 74,000-square-foot facility uses advanced technology to reduce costs and, coupled with generous local tax breaks, is one of the first to return to America. Of course wins like adidas don’t just happen. They are the result of planning and diligent recruitment efforts that have raised the county’s profile in the business community, says Ahrens. Creating more opportunities to work close to home became particularly important after the county conducted a major survey of residents about what amenities they wanted to see in the community and how much they wanted to trim their daily commute. The survey helped produce a strategy focused squarely on entrepreneurship – and a program called Fresh Start Cherokee, which helps support and offers educational opportunities for folks seeking to start their own businesses. “We need to create this entrepreneurial ecosystem for Cherokee, because right now as far as startups go there’s not a support system,” she says. The need for a central point of contact for business information led to the creation of a one-of-kind coworking and incubator space in Woodstock. Located in the renovated, historic gym on the campus of Chattahoochee Technical College, The Circuit provides space to work and meet clients as well as access to resources aimed at making the startup process a little easier. The space is open to Chattahoochee Tech students so they, too, will have the opportunity to meet and perhaps work with local entrepreneurs. Adding to the resources, the county’s and the city’s economic development offices moved to the campus. “The whole conversation around the program started two years ago with the idea of making this a collaborative work space,” says Brian Stockton, Woodstock’s director of economic development. Along with the large open gym floor that now houses most of the coworking and meeting space, the building has offices that were once occupied by the school’s principal and staff. “That’s not space we can use for classrooms,” says Jennifer Nelson, Chattahoochee Tech’s vice president for external affairs. “We realized it might be the perfect location for this kind of collaboration. The gym is also a good example of Woodstock’s approach to repurposing historic structures. During the renovation process, many of the architectural features such as the hardwood floors and beadboard walls were preserved. The basketball floor still has painted lines, and the old scoreboard is in place. The college was receptive to the idea of an incubator, because providing training and support for businesses is one of the primary missions of the technical college system. Making The Circuit available to students and the public provided other advantages. “Businesses, community members and students can engage and get to know each other and find ways they can partner,” says Nelson. The main purpose, though, is helping business owners. Entrepreneurs may know their product or services, but they often have less understanding of the mundane business functions that are essential to success. The Circuit, which is run by a full-time director, will provide help in areas ranging from accounting practices to real estate selection to getting a business license. Nix and another local business leader, Russ Sanders, president of FactoryMation, an industrial-control products company, were among the first to pitch in and offer their own expertise to startups in the space. Both know well what is needed to build a successful operation and want to share that with the community. For the companies that become successful, the likelihood is they will remain in Cherokee and add to the local job market. “As we continue to grow and as companies continue to relocate here, that brings additional jobs, and that will mean more people are just commuting down the road rather than across the county line,” says Carnes. Cherokee has also caught the eye of the medical industry in Atlanta, with the idea of taking healthcare services to where patients live rather than forcing them to trek to hospitals in Atlanta. Northside Hospital-Cherokee is in the midst of building a replacement facility for the original hospital constructed in the mid 1960s. Scheduled to open this fall, the $250-million project includes a 450,000-square-foot hospital with an 125,000-square-foot medical office building on the campus, as well as a parking deck with 900 parking spaces. Located at I-575 and Georgia Highway 20, the project has set off an explosion of growth in the area, including the nearby Canton Marketplace and Canton Exchange shopping centers. Once the facility is completed, this section of the county near Canton will see more hospital and medical office workers as well. Situated in the south end of the county and in the path of advancing growth from Metro Atlanta, Woodstock has excelled in building a city that is both inviting to business and livable for residents. To accommodate all of this business growth, the city has added nearly 1,600 single-family homes in the last five years. There are also more than 1,100 apartments and condos, such as the Woodstock West by Walton apartment complex, along with about 300 senior housing units. The successful Outlet Shoppes at Atlanta, located at the junction of I-575 and Ridgewalk Parkway, brought more than 80 high-end outlet stores to the area and is credited with creating a high-profile retail corridor. A couple of decades ago, businesses shunned downtown. Today, Woodstock is suffering from a shortage of retail space. It simply can’t house all the stores that would like to be a part of this renaissance. Cherokee County has seen the future, and it is no longer the rural community tucked away from everything. For leaders and local citizens, the goal now is to master growth and its benefits without losing the charm that first brought people and business here. No visit to Ball Ground would be complete without stopping by the Ball Ground Burger Bus. This c. 1948 electric Atlanta Transit Authority trolley #1386 roamed the streets of downtown Atlanta from 1948 until the 1960s. After it left service, a Ball Ground resident bought it and brought it north, where it languished until the city purchased it. Nobody seemed to know what to do with the big, out-of-date electric bus. That is until Dylan Brown took a look and saw its real potential. Since opening in 2015, the Burger Bus has become a must-see for visitors to the city and a dining destination for locals. The inside, while renovated, kept the vintage look with stools for seating and the original fare box intact. Outside, the doors and windows were restored and the trolley was painted to ready it for diners. The restaurant’s kitchen, where specialty burgers of hormone-free, locally sourced Angus beef are created every day, is in a building adjacent to the trolley. The restaurant is also part of a revitalization of the downtown that has seen long-shuttered buildings put back into use.